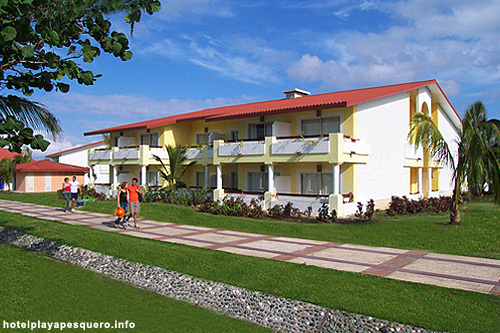 Hotel Playa Pesquero is a complex that is characterized by a modern architecture with Caribbean style that achieves a perfect mixture among the man's work and the marvels of the nature that it surrounds it. With a very original concept, it tries to combine local tradition with the tourist image of the Caribbean, as well as the autochthonous culture. Modern bungalows of 2 floor is intertwined to form the Hotel Playa Pesquero, its construction and decoration they recreate the cultural traditions of the region faithfully reproducing elements that personalize them as the oldest locomotive in Holguín, its paved streets as if they were railroads, blocks with the names of streets and picturesque places of Holguín and Santiago from Cuba.